Implant dentistry is ideal for individuals who are missing one or more teeth due to gum disease, decay, or trauma. Millions of Americans turn to restorative care for permanent solutions to their missing teeth. Implant dentistry refers to a special kind of restorative care. 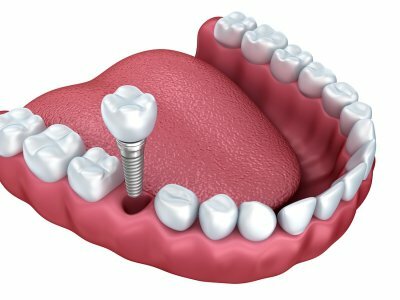 Dental implants are tiny titanium screws that a dentist surgically implants in a patient’s jawbone. This method of restorative care works because the tiny screws act as roots for missing teeth. Dental implants can be covered with dentures, dental crowns, or a dental bridge. While implant dentistry was formerly reserved for individuals who were missing multiple teeth, a dentist now suggests dental implants for anyone who wants a permanent solution for a missing tooth. After the initial surgery, which requires two to six months to completely heal, your dentist will place a dental crown or other restoration. You will then have a full set of teeth that functions and looks just like your smile did before you lost a tooth. For everything you need to know about implant dentistry near Hazlet , look no further than Glenwood Premier Dental. You can reach us at (732) 264-4477 to learn more about implant dentistry and schedule a consultation to find out if dental implants may be right for you. When Should You Talk to Your Dentist About Mouth Sores? Mouth sores, also known as canker sores, are a common oral condition that affects most people. The sores usually appear in soft areas of the mouth that are frequently agitated, such as the tongue. They are often minor and heal themselves quickly. If you suspect your mouth sores to mean something more serious, contact your family dentist serving Hazlet as soon as you can. Though they may be common, it is important to know when to contact your dentist about canker sores. Sores can cause you a lot of pain, especially if they are ulcer-like. If the sores persist, have difficulty healing, or multiply, be sure to talk to your dentist. Tell your care provider if you are also experiencing fatigue, fever, or rashes, as this could be an indication of a subsequent problem in the body. Your dentist can help you figure out if there is a connection to your diet or lifestyle that may be causing mouth sores in order to prevent them. Come to Glenwood Premier Dental in Hazlet for all your general dentistry, periodontal, or emergency dental needs. Our caring staff will provide you with the utmost quality of dental care. Call us at (732) 264-447 or visit us online to learn more. When you have one or more missing teeth it is very important to seek treatment. 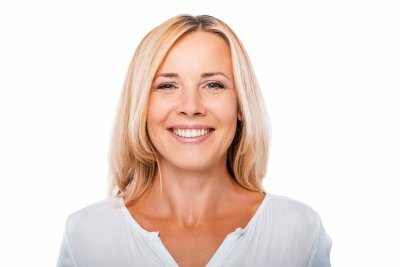 There are many options to choose from when considering how to replace missing teeth. Your dentist in Hazlet offers services such as implant dentistry and dentures . There are different benefits for each option, as well as certain drawbacks. Continue reading to learn what you should consider when choosing a treatment for tooth replacement. Dentures and implants benefit your mouth by supporting its structure with tooth-like replacements. Dentures are meant to fill in gaps between natural teeth and restore the mouth’s shape. Implants are designed to replace a single tooth while keeping the jaw stimulated . Either way, each device requires a way to stay attached to your gums or jaw. Partial dentures are supported by metal clasps that attach to your existing teeth. They require the health of the gums they rest upon, as well as surrounding teeth. A dental implant is more invasive, as it is placed into your jaw as a permanent fixture, acting as a tooth’s root. It can feel challenging to perform normal tasks, such as speaking and eating, while wearing dentures. They may have a tendency to slip out of place or become uncomfortable. Permanent implants allow more ease of speech, as well as more comfort while eating. Dental implants are discreet because they mimic natural teeth. Complete or partial dentures may be more apparent both to the wearer and others. On the other hand, dentures can be adjusted or modified more easily because they are removable. Over time, dentures may put stress upon the supporting teeth and gums. Implants act on their own as a form of replacement, while simultaneously preserving the bone and gum tissue. Dentures need to be replaced every five years or so, whereas implants may keep up for 15 to 20 years. Lastly, dental implants will likely be more expensive than dentures. Be sure to consult with your dentist about which treatment is best for you and your situation. The dentists at Glenwood Premier Dental provide personal and expert implant dentistry care. Call us at (732) 264-4477 to learn more, or visit us online . Nerve damage can occur when the dental pulp inside your tooth is infected or exposed. 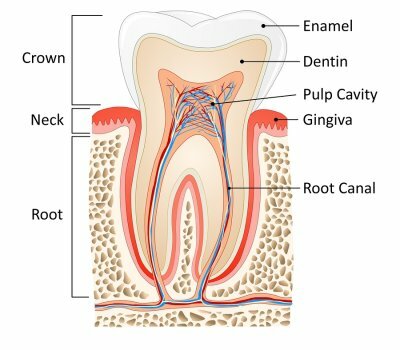 Your teeth are made of dentin, which is covered by the enamel you can see. Under the dentin is the dental pulp, which is a soft tissue containing nerves and blood vessels. When injured or damaged, these nerves can cause you a lot of pain and require immediate treatment. If you think you have nerve damage, it is important to see your emergency dentist in Hazlet to avoid complications. Continue reading to see if your teeth have signs of nerve damage. Receiving a traumatic blow to the jaw or teeth, which is common in sports, can lead to nerve damage. It is important to notice if you have any broken or cracked teeth, as well as severe pain following the accident. A cracked crown can cause the tooth’s nerves to be exposed . There is also a possibility of a root fracture, which requires immediate dental attention. If you have noticed advanced decay on any of your teeth, be sure to get to the dentist. Decay can wear your tooth down to the nerve and cause the dental pulp to be exposed. Exposure can lead to an infection in your tooth’s nerves. You will notice pain and sensitivity when breathing or ingesting cold or hot liquids and foods. Swelling of the face or jaw around a painful tooth may suggest to you that you have an abscessed tooth. This is caused by an infection at the root, most often caused by decay or injury. If you think you have an abscess this is a good indicator of nerve damage. Blood flow and cellular activity increases around damaged or dead dental pulp, causing pressure to build up. This requires immediate dental attention. A dental exam is required to address the extent of your nerve damage, as well as what kind of treatment is most appropriate. You will receive quality care from the staff at Glenwood Premier Dental during your consultation. If you have questions, call us at (732) 264-4477 or visit us online for more information about our services.